i've never installed or used MPDN before, i'll have a look tonight, if its fine in MPDN what does that tell us though? Out of interest, why are people setting custom resolutions in NVIDA when they can be created in MADVR without any fuss, is it so you can create custom bit rates and colour space as well, I dont know much about the NVIDIA side of things though. 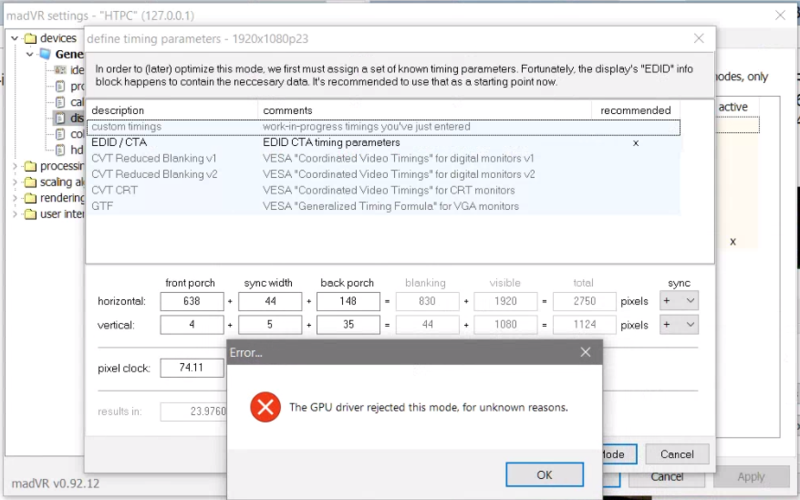 Since nvidia broke the support for custom resolutions it doesn't work anywhere, trying to set it in madVR also doesn't work anymore, it gives you this error when you try. It just doesn't allow any new modes to be added. Just the default ones that are already there can be applied. I'm guessing nvidia changed some security setting that doesn't allow some registry keys to be changed if it recognizes that an HDTV is connected. I'm not really sure. Maybe there is some registry tweak that we can do to allow new modes to be created again. Last edited by FDisk80; 28th March 2018 at 14:06. Your recent post re: DCIP3 vs BT.2020 has confused me. 99.99% of consumer commercial UHD HDR content (mostly UHD Blurays) is mastered to BT2020 with a D65 white point. A few titles are mastered in UHD rec-709 SDR (such as The Fourth Phase), but they are really a handful. Out of these BT2020 titles, 99.99% are graded on a monitor with DCI-P3 capabilities, but they are still using a BT2020 container. A few titles (more and more as both grading displays and consumer displays evolve) are starting to use beyond DCI-P3, so report a grading monitor with BT2020 capability. For the user, it doesn't matter. The only correct calibration to use for consumer content is BT2020. It doesn't matter if the capability of the consumer display is limited to DCI-P3 or not (most are), the saturations/calibration has to be BT2020. If your display only says "wide", then you have to measure it (not only at 100% saturation, but also within the gamut at say 25%, 50% and 75%) in order to establish if the calibration tracks DCI-P3 or BT2020 saturations. For example, on the JVCs, the first HDR models had a reference mode that tracked DCI-P3, which was incorrect. I had to create a BT2020 color profile tracking BT2020 (even if the native gamut was still not wider than DCI-P3) to reproduce HDR content correctly. JVC soon after released exactly the same calibration to correct their initial error. There is no way to know which display is doing what, so whether they are doing it correctly or not. The only thing I can tell you is that consumer content (ie content you purchase, not early demos) are almost all using a BT2020 container. So you have to use a BT2020 calibration if you want to reproduce the colors correctly. That is in passthrough mode or with sources other than MadVR. If you use HDR to SDR conversion, then you simply have to either select what the source expects (for example, the UB 900 or the Oppo 203 players will output SDR BT2020 or SDR BT709 with a power gamma of 2.4, so you should select a calibration that does the same), or if you're using MadVR you can tell MadVR what your display is calibrated to, and MadVR will do the conversion for you. So if you use only MadVR and are happy with the HDR to SDR mode, you can tell MadVR to convert to DCI-P3, and it will do it. But if you want to use the same calibration with other sources, then you have no other way than creating a BT2020 calibration, because no consumer source will ever output DCI-P3. DCI-P3 isn't a consumer format. It won't be in any consumer content, and it won't be sent by any consumer source. - If you want consumer HDR sources other than MadVR to use the same HDR calibration, or if you want to use MadVR in passthough mode, you have to create/select a BT2020 calibration. - If you only use MadVR, or if you can create a 3D LUT converting to whatever your display needs, or if you're happy with MadVR HDR to SDR conversion, you simply have to know which gamut your display is tracking in it's "wide" mode, and specify this to MadVR / use the correct 3D LUT. No, not just my display, it depends on each display but the above applies to any display. It also depends if you're using a different calibration for SDR BT709 and HDR BT2020, or if you're happy to have MadVR convert everything to a single calibration (usually the widest). It's not an option with projectors because you lose a lot of performance in either HDR or SDR if you use the same calibration for both. It is risky to assume that because the native gamut is closest to DCI-P3, its "wide" setting, because it measures close to DCI-P3, is actually tracking DCI-P3. It might be the case if it's an early HDR display, an SDR display or a poorly/wrongly designed HDR display, but it shouldn't really. It should be tracking BT2020 saturations. You have to understand the distinction between the maximum native capability (the edge of the gamut) and the way the calibration tracks within the gamut. If your display is a HDR consumer display and has a valid/decent HDR mode, it should be using a BT2020 calibration so that it tracks properly BT2020 content, even if the edge of its native gamut doesn't go beyond DCI-P3. Otherwise you will have correct colors at the edge of the gamut, but incorrect colors within. This changes if you're using an HDR to SDR calibration with MadVR, or if you're using 3D LUTs to convert from one gamut to another. This is frankly off topic here, but you are making a lot of wrong/risky assumptions in what you are describing. Last edited by Manni; 28th March 2018 at 16:44.
have you tried tweaking the timings at all by a single digit, I was doing that with my 1050 to try and maximise the frame drop internal, I say that as some of the timings gave this error suggesting they were out of scope, you might find one thats close enough to use in the meantime. thats only half the story though, putting my TV in PC mode and leaving DIRECT3D11 ticked produces the correct image, as does turning off refresh rate switching and having movies play at 60hz, none of this makes sense, its not as simple as just saying either its a D3D problem or a GPU driver issue, you cant say that until you know the exact cause, I dont think anyone does. Last edited by mclingo; 28th March 2018 at 15:43. Read the first line, "display." Your display is not switching to 23.976. Are you sure your display supports this? A list of compatible refresh rates is shown in the drop-down. As for the HDR movie, it doesn't look like passthrough is active. Are you using passthrough? Does your GPU and display support HDR playback? And the 4:4:4 image? Don't worry about it. There is nothing you can change in madVR to alter this. The mode you are using might be 4:2:2, but this won't matter too much. Look up your display on Ratings.com for more technical information. if mpdn has the same problem it is clearly not a madVR problem. both my TV's are doing it, my EF950 2015 OLED and my 2016 Samaung MU7000 so its not my main TV, its something to do with my GFX card, I acknowledge that as it didnt do it when I put the NVIDIA 1050 in, however, the question is, does a tweak need to be made in MADVR or with the AMD driver or elsewhere to resolve this, thats the question we need answering, I would have thought MADSHI was the only person who could answer that. What if MPDN doesnt have the same problem, its definitely MADVR then? This is good info and an important way to think about these issues. However, I did a lot of measuring and I am pretty convinced that for SDR my display is best used with madVR by setting DCI-P3 in madVR. If I set BT.2020 in madVR it is under saturated everywhere, not simply at the edges. I think you misunderstood my post because I completely agree with you when the display is in HDR mode. It is only in its SDR "wide" mode that it seems to be calibrated to DCI-P3. I never have the TV in HDR mode while watching SDR content. You are in a weird situation because the options on the calibration page in madVR normally do not affect the output when watching HDR content on an HDR display. For HDR setting DCI-P3 or BT.2020 is only an option when using "process HDR content by using pixel shader math", and when using that option almost everyone should use BT.2020. Again, this is only on madVR's hdr page, not its calibration page. Re: DCIP3 vs BT.2020 vs BT.709 vs Disable calibration control for HDR and SDR (all resolutions). I don't have an "enhanced" setting on my display? I don't have a "wide" setting? If you mean FULL aka Normal aka 0-255, yes I have that and I use 0-255 in all my hardware and all my software. I was not limiting my questions to HDR only. I was pointing out that a correct value of BT.2020 for HDR sources is not a correct value for SDR sources in my display. Using that, SDR looks under saturated. When viewing SDR, if I change the value to BT.709, DCIP3, or disabled, it looks much better. I am using "passthrough HDR content to the display" and am allowing the panel to convert and process HDR. So, these settings in madVR for HDR don't apply. What will apply is SDR calibration settings in madVR. Again, what looks the best to me are BT.709, DCIP3 or disable. I can't see a difference between any of these. BT.2020 on the other hand, looks under saturated. It also isn't reported in the OSD for SDR. BT.709 is. In the past I simply chose DCIP3 and it looked good for HDR and SDR. Now you're telling me HDR is best with BT.2020 and not to use DCIP3 for those. I can't use BT.2020 for SDR so I guess I have to separate HDR from SDR and apply accordingly. All of my HDR titles are UHD HDR 2160p and they are all BT.2020 and they all report they mastered in DCIP3. All of my SDR are 1080p, 720p, 540p (SD) and they are all BT.709 (best guess). I created a profile for 2160p through SD resolutions. 2160p (all HDR) calibration I set to BT.2020. (not that it matters since everything is passing through so why create separate profiles other than you say to use BT.2020 even though I'm passing through) All the others I set to DCIP3. I can also set all these others to BT.709 or disabled. Which would be more correct, for these others, DCIP3, BT.709 or disabled? I assume BT.709 since that is the 'best guess' reported but you say DCIP3 is better so I'm using that. Or, am I completely doing things wrong here and if so how would you do it if you were me? Describing various branched off scenarios is not me. I'm not using HDR to SDR conversions. I don't use 3D LUTs. I'm in standard mode and asking about SDR, not HDR. I don't have meters and such to measure and track gamut widths. I'm asking specifically for my setup if you were me. If you need further details, I'll be happy to oblige. Last edited by brazen1; 28th March 2018 at 18:50. My display is LG E6 so im sure it support 30hz though, i thought you mean to change refresh rate in nvidia control panel so there i can change but only when not playing any movie, once movie is on refresh automatically change to 59hz in nvidia panel. I will try to check on windows display settings, and see there. The part about image i was just curious why i cant see any numbers on madshi chroma pattern test when i have set full RGB with black levels on high in TV settings, once i set black levels to low i can see both number 4:2:2 and 4:4:4... but then black is way to bright, i though maybe this is a bug or something. It sounds like your TV's processing is 4:2:0 when you set black levels to high. 4:2:0 should be the only time you do not see either number in the chroma test pattern (just in case, make sure you are viewing it 1:1). Yes, I also found out that in all those latest broken drivers setting the custom resolution to 1920x1079 instead of 1920x1080 for example does let you create, tweak all other timings and apply that custom resolution in nvidia control panel. But doing this makes the picture a little bit strange, it is a bit blurrier because the resolution is no longer a native one. Also even with 1920x1079 madVR cannot switch to this mode because when trying to set madVR to 1079p24 when it goes full screen it will mark this setup as invalid and does not let you apply this mode. So it just defaults to 1080p24 with non of the settings applied even if you keep the 1920x1079 mode set up in nvidia control panel. So it looks like nvidia did something that locks the native 1920x1080 resolution so it is no longer possible to tweak unless you also change to non native / non standard resolution. Last edited by FDisk80; 28th March 2018 at 19:53. If u mean by 1:1 fullscreen then yeah i always look at the pattern in fullscreen. It's quite funny cause this is the only mode i can't see any number on it. When i set Ycbcr either 4:2:2 or 4:4:4 there is always visible one or both numbers depending on mode. So my question is, should i worry about it ? shall i leave it like this ? or i should change something ? what i should see when i set to full RGB ? I need to check if i have same issue on PC mode input on TV when set to Full RGB. I looked up your display on Ratings.com. It does 4:4:4 at 4K @ 30Hz. It does support native 24p playback, so something is wrong with your GPU and its drivers. It also supports HDR10 playback, so passthrough should work. You need a GPU with HDMI 2.0 and an HEVC decoder. Does your GPU qualify with these specifications? This would not explain your issue with refresh rates, however. Last edited by Warner306; 28th March 2018 at 20:05. Doesnt look like MPDN does 23,976 playback, i cant see anything in settings and nothing comes back on a google search, any other DIRECT3D11 players? Re: DCIP3 vs BT.2020 vs BT.709 vs Disable calibration control for HDR and SDR (all resolutions). You don't need to worry about HDR calibration settings at all because you are using HDR passthrough. That discussion only related to the complex topic of HDR -> SDR conversions, which can use specialized hardware and software to create multiple calibrations for a projector. So ditch the madVR profile. For SDR calibration, if your TV doesn't have a gamut setting, it can be assumed it is BT.709, as this is the correct calibration for SDR content. I could be wrong, but that is most likely. Check your display on Ratings.com for more detailed discussion. My card is Nvidia 1060 rog strixx so yeah it does have hdmi 2.0 and hevc decoder, hdr it works fine tbh when set to passtrough cause tv shows hdr mode when starting hdr movie. The only thing what's odd is refresh rate, like I said before I can change it to any from 23 to 59hz but once I start any movie is automatically change to 59hz. Can this be happening cause of the reclock?